We have only been checked out of these apartments for a day now, and have already made arrangements to go back next year to visit the most amazing family i have ever had the pleasure of meeting! Totally reccommend the bbq nights, I did both weeks because it was such fun, and the food was out of this world, cooked by the famous George(love ya hunny). The home-made wine and raki along with this food is more than worth the 15euro's each it will cost you to do this evening, children are also welcomed here at special prices as well. Michael is the most fantastic host, Billy the most funniest man in the world!! (your'e my lover.........undercover!) cheeeeeeeeeeky monkey!! love ya Bill! Between Billy, George,& Michael your holiday is guaranteed to be fantastic. Marina, manos and Babas michaels gorgeous family love you guys!! Big shout out to Dianna, & Tony lovely English couple now living in Stalis who help out alot at the hotel great for advising you on the best places to visit whilst on your holiday there. Marina's breakfasts are fantastic value for money cheaper than in the resort itself,6 euro's per person. the eggs are fanatstic out there. Non slip shoes are worn by the greatest barman, who still manages to fall over in them(so funny Billy). The pool is smallish but was lovely to swim in and the pool area was forever clean and tidy. The pool bar is a new addition to the hotel, very nice drinks ranging from slush puppies,soft drinks, cocktails,beer, bottled beers and alcopops, wine, all spirits you can ever want, and then the famous Raki!! Whilst on the subject of Raki, you are given this in most places you visit in the resort by owners and staff of the pubs and taverna's as a way of thanking you for your custom which i think is rather polite of them. There are so many great places to eat in the resort, but the food at the dyktinna is lovelly and cheap! 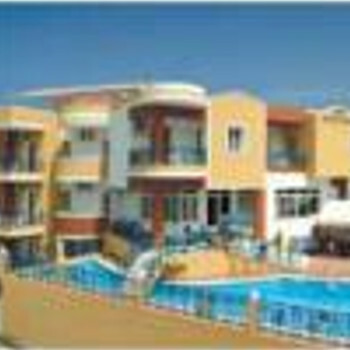 the same at the filia( the hotel 2 doors down) you can use the facilities of both pools and bars/food etc which is great for when you fancy a slight change of scenery whilst still chilling in the hotel grounds. Nothing is ever too much trouble for the huge family that run both these apartments,they are fantastic people who will endeavour to see you enjoy your holiday to the maximum. The bbq night and the occasional footy match really is the only entertainment at the dyktinna the filia is much louder more entertaining for a boozy fun filled night, with both these bars open till at least 2in the morning you really can choose weather to chill out at the hotel or have a few drinks to get in the mood before your night out. The apartments them selves are basic but extremely clean bins are emptied regularly, sheets changed, towels changed regularly also. The kitchenette has a 2 ring hob and a fridge, hot and cold water, cups,plates,cutlery, pots and pans are provided for any cooking which you may want to do if you need anything then just ask, as they are only too happy to be of assistance to you. I cooked on a couple of occasions in the room, I did a full English, lots of pasta, Bolognese, bacon butties, egg butties, and more. Sorting out lunchtime snacks in the room is really easy as there is a supermarket very close to the hotel, selling pot noodles and fresh breads,cereals etc. My hubby and i ate out every evening. But as I said do try the food at the Dyktinna they will cook you absolutely anything at any time. My hubby fancied a pepperoni sandwich but mike didnt have any so he sent marina out on her little moped to the supermarket and she brought some back for him,( we didnt realise at first that she had gone to so much trouble for us)you don't get that kind of service here in the uk do ya! bless um. Food at the hotel ranges from pasta's,chips,local dishes like mousaka and gyros,jacket potatoes, salads, sandwich's you name it and they will try their hardest to give you it! The beds in the rooms are singles, we did ask for a double but ended up pushing our singles together, Michael didn't seem to mind. Very comfortable. I suffer with a bad back, and these beds were great for me. If you need any more pillow's or blankets just ask, they won't mind. The hotel is just off the main road and it can be a little noisy for the front facing rooms, but only when the doors are open, you won't be annoyed by street noise whilst you are sleeping, the doors are rather sound proof. Make sure you do keep doors and window's closed at night though as the mozzies are about!! not a big problem but they are around, so remember to take your plug-ins and sprays. Also remember to take a couple of cardigans or shawls for covering the arms as the evenings do tend to chill down from about 9.30 onwards, during the early season. When we arrived at the hotel it did not look promising, we asked for a double bed and got two single beds. However when we asked Michel the owner he said that there were no double beds and he had told his reps to please stop telling guests there are. So there isn't any! The next day when we felt better we had a look around and it was extremely nice, the breakfasts cooked by marina are absolutely fantastic as is all her food. Michel and his family are so friendly and will go out of their way to help you and make your holiday unforgettable. It was situated in a good place set back from the main road, easy to walk to and from the beach, bars, and restaurants. The bbq nights are well worth the 15 euros each you are well entertained and looked after all night long. The hotel rooms are basic but when all you do is sleep shower and change there it doesnt really matter. It is ideal for couples and young families. Would highly recommend staying there by all means, we are already making arrangements to go back in September and may next year if possible. We stayed in The Dyktinna Apartments, Stalis on a self catering basis on the first two weeks of the season. The complex was very clean and tidy, although I don't think they had employed regular cleaners for the rooms yet as this could have been improved. The food at the accommodation was fantastic, no faults at all, and for a 'Brummy' couple that's saying something. One thing we did do was go out and buy a kettle from the nearby supermarket. It would have taken forever to wait for the water to boil in the stewpan. I had no intention of spending my holiday cooking, so we ate out every evening, either in a beachside restaurant or at the Dyktinna complex. There are loads of restaurants and pubs in Stalis at very reasonable prices so there should be something for everyone's taste. The cakes are to die for - although Gary restricted my intake (I haven't let him forget it). Zoe was our Thomas Cook rep for our holiday, and she did a marvellous job at settling us all in and kept to her meeting times and visits. There is a very useful book in reception with plenty of trips, local information and guidance for your holiday. One thing you must do is go on the little train, it's only 7 euros each and it takes you to places you wouldn't normally get to see. The journey is for 90 minutes, so you certainly get your money's worth. We love Aghios Nik (can't spell it sorry). It is absolutely beautiful and well worth a visit, just spend a few hours people watching while having a drink by the water, what more can you want. The water world is very small but has some interesting specimens in it. This is in Hersonnisos and well worth a visit. Go there at the start of your holiday as we didn't realise but you can visit as many times as you like after paying the one entrance fee - just keep your ticket and sign it on each visit. Remember it is very small, and there isn't a cafe, but the children will love it. Gouves is another must for visitors. It is so beautiful. We stayed there on our previous holiday to Crete and made a return visit to say hello to old friends. Unfortunately I needed medical attention whilst on holiday after breaking my foot and highly recommend the medical staff and hospital facilities. Just make sure you have all your documents with you when you go for treatment and it will be superb attention. The location of the Dyktinna is ideal. It is right on the bus route to all the resorts on the north coast. Don't hang about though, when you see the bus don't expect it to stop unless you wave like mad and don't hang about when getting on the bus, or you'll have a 'nice' man pushing you from behind!! (That was my excuse anyway). We asked for a quiet room on an upper floor when the holiday was booked, and that is exactly what we got. It was at the back of the apartments with a lovely view although the sun found it difficult to emerge through some nearby trees, but at times it was a nice relief to have a bit of shade in the afternoon. There was little entertainment, but we didn't go away to be entertained, we wanted a well earned rest and to meet some lovely people, which we did. Hello to everyone who remembers us. We would certainly return to the Dyktinna, taking our travel kettle with us! We were very disappointed with the room that we got at these apartments. We were not told that we would be looking on to a ceramic tile depot. The room was very basic ie two single beds and a bench bed for my daughter also no kettle, toaster, microwave etc. Just a small 2 ring heater to make tea we had to boil water in the milk pan which took about half an hour. The bathroom was very small you had to close the door to have any room to move. All the bed sheet felt very cold and damp. All in all a holiday we won't forget. This hotel was fantastic the staff were really friendly an super helpful. It provided all your basic needs and was in a fabulous location! Had a great sunny balcony overlooking the atrractive an very clean pool would stay here again!